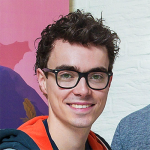 As co-founder and creative director of Twirlbound, Matthijs is concerned with the design and production of their games, as well as running a creative business. Currently, Matthijs is mainly occupied with Pine, a game about adaptation. After an extensive research phase, in which Matthijs likes to incorporate fields of study from beyond games, he went on to produce the game with five colleagues. Through crowdfunding and talks with publishers, they are now building the ambitious action adventure game set on an island where humans never reached the top of the food chain. With Pine being their first big game, Twirlbound sets the path to build more in the future.